TEMPE – From the Viking landers in the 1970s to the most recent Curiosity rover, machines have acted as scientists’ eyes on Mars. And in 2016, NASA will send another lander, called InSight, that will study the red planet’s interior and seek answers about the formation of rocky planets. But first, NASA had to figure out a safe place to land – and that’s where Arizona State University’s School of Earth and Space Exploration comes in. 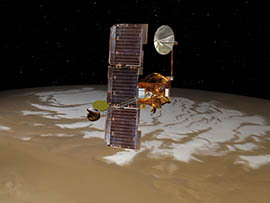 About 40 faculty members and graduate students here manage the thermal emission imaging system, or THEMIS, an infrared camera attached to the orbiting Mars Odyssey spacecraft, which launched 13 years ago. Jonathan Hill, a mission planner and graduate student, operates the camera, telling it where and when to take photos. THEMIS is also helping scientists understand what the surface is made out of – from the famous orange sands and dust to solid rock to any possible abnormalities. 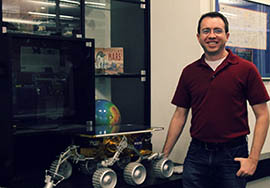 Christopher Edwards, a research physical scientist with the U.S. Geological Survey whose emphasis is on Mars studies, worked on THEMIS during his five years as a graduate student at ASU. He said the InSight lander aided by THEMIS has a seismometer on it as well as a temperature heat flow probe. THEMIS was designed by Phil Christensen, a professor at ASU. It was built at the university by a small group of engineers from ASU and Raytheon. “Dr. Christensen has also designed a lot of other infrared instruments for NASA and so when they decided they wanted an infrared imager, he was sort of an obvious choice,” Hill said. Hill said ASU will continue to be part of the InSight group, monitoring from above things like dust in the area. For example, if there’s too much dust blowing around it could obstruct the solar panels on the lander, potentially endangering the mission. The team is also looking into using the camera to pick out a landing spot for another Mars lander planned for 2020. Everything that has landed on Mars since THEMIS was launched has been helped by the camera. An artist’s rendering shows the Odyssey spacecraft orbiting Mars. Among its equipment is a camera designed and monitored by Arizona State University. Jonathan Hill, a graduate student in Arizona State University’s School of Earth and Space Exploration, stands next to a model of the Sojourner Mars rover.